RUSH: I don’t know if you people heard this or not. I’m gonna get back to this Ignatius thing in a minute, because I haven’t made the point yet. There’s an infobabe at CNN by the name of Deb Feyerick. And over the weekend, I guess Saturday afternoon,she was reporting on CNN about an approaching asteroid that will pass by the earth on February 15th, and it’s gonna be relatively close in astronomical terms. It doesn’t pose any kind of a threat yet. She actually asked her guests, and I don’t know who the guests were, she actually asked if the approaching asteroid, and she was serious, she asked if the approaching asteroid is an example of perhaps global warming. I kid you not. Cookie, do we have this in the sound bite roster? I went through this very quickly, and I don’t recall seeing her name here, but I don’t need it if you don’t have it, it doesn’t matter. If I have it here, I’ll play it. Sheila Jackson Lee comes off as Einstein compared to this. But the point here, this is an object learning lesson. She was dead serious. She was not trying to be funny. She thought she was asking an enlightened question. Now, moments earlier, before they’d had a spot break, she segued from the Northeast blizzard to a segment, Bill Nye the Science Guy. And by pointing to global warming, “Every time we see a storm like this lately, Bill, the first question to pop into a lot of people’s mind is whether or not global warming is to blame.” And that’s true, and that’s one of the signs of evidence of the success of the whole politicization of global warming. Every time there’s a temperature change or any kind of extreme weather, everybody just asks or thinks, even those of you who know it’s a hoax, everybody’s been so conditioned now, “Oh, global warming,” you know somebody’s gonna say that. So in Deborah Feyerick’s world global warming is not limited to earth. Global warming is taking place throughout the universe, and global warming could be affecting asteroids. In fact, the asteroid coming close, she actually asked the science guy, “Is this an example of perhaps global warming?” And to his credit, Bill Nye, the science guy, was a little confused and flummoxed. Now, how does this happen? Obviously she’s a product of her education. She’s a product of her environment. She is part of the media, the Democrat Party massive apparatus. She lives in her cocooned world just like they all do, and they believe global warming is happening, and it’s manmade. Snerdley is shouting at me over the IFB, “Obviously she’s an idiot.” It’s more than that. I mean, if she’s an idiot, they’re all idiots. I’m gonna be a little charitable. Yeah, you have to be a little bit of an idiot to think that this is possible, but if this is the way you’ve been educated, raised, trained, if this is what your worldview is, it’s quite natural to ask this question. And, as I say, it’s an object lesson into where we are. Now, ladies and gentlemen, I was made aware of a book over the weekend. 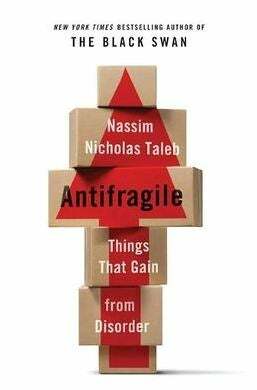 A friend of mine is reading a book out there called Antifragile by Nassim Taleb. Who knows if I’m pronouncing it right. It’s N-a-s-s-i-m Taleb. Nassim Taleb. It’s Antifragile, and it’s a book about a different way of looking at things, from the standard daily and ordinary media template or narrative that everybody is subjected to. You can’t avoid the daily narrative. The daily narrative of global warming has been going on for 25 years. It’s why Deb Feyerick thinks that she’s asking a brilliant question. Now, this author, Nassim Taleb, in his book Antifragile, says something fascinating here about journalism that is relative here to her question. “In the past journalism was an act of courage, revealing truths in the face of powerful establishments and risking jail or even death. “Today [journalism] is becoming the refuge of disconnected cowards. In my entire career, he writes, “I have never seen a financial journalist go to ‘the other side’, that is pull the trigger or engage in risk taking or in any situation in which one can be exposed to harm from one’s opinion. This can be generalized to journalists in general, who rarely, if ever, switch to doing, all the while pontificating on ‘Steve Job’s mistakes’ or similar purported errors of others, or praising Geithner and other powerful frauds. The whole coward business basically is: Here you have a bunch of people on the sidelines who’ve never done what they’re reporting on. He uses financial journalists as an example. They’ve never taken a risk. They’ve never started a business. They’ve never done any of these things, or very few of them have. They’ve done very few of the things they’re reporting on, and yet they sit there and they pontificate as all-knowing. They sit in judgment of everybody. They’ve never played the game, but they report on it as though they would be the best ever if they did play. In politics, they’ve never run for office. They’ve never been in the arena. They’re always on the outside telling everybody else who’s right, who’s wrong, who’s smart, who’s dumb. But they’re basically disengaged. That’s what he means, I think, by “coward.” They’re afraid to get into the arena and take the slings and arrows. You know what happens when a journalist has journalism committed on them. They go absolutely bonkers! You don’t dare investigate them. You don’t dare subject them to the scrutiny that they use to scrutinize others. You just don’t dare. They think they’re immune ’cause they’re journalists. But then the killer there is, the kicker here is, the tragedy is that the doers are in contact with the world through journalists. So the doers, the people out there actually doing something — the people trying to make something, trying to build something, trying to get something right — their contact with the world is through these people who don’t do anything. Now, what does this have to do with Deb Feyerick? What it has to do with Deb Feyerick is that she’s basically ignorant. She has no idea. She’s talking about global warming and an asteroid, and whether or not it’s affected by global warming. She’s basically as distant and as far from the reality of science and global warming as anybody can be. Yet, in her mind, she’s right in there. She’s reporting on it, which to her is the same thing as being involved in it. That’s true with political journalists and it’s true with sports journalists. I think it’s profound. Now, I haven’t read this book. This is just one little excerpt. I know that’s what this book’s about without having read it. I know exactly what this guy’s talking about. It’s about the prison that we all live in based on the way we think, and it’s pretty narrow. In particular, he’s writing about journalists. Far from being worldly and aware, they live in this narrow little bubble. Their life experiences pale compared to those they’re reporting on. Yet they end up being perceived as the experts and the people doing are the ones who are the criminals. The people doing are the thieves. The people doing are the cheats. The people doing are the liars and the felons, and the journalists are the paragons of virtue. Now, as to this, “The three most harmful addictions are heroin, carbohydrates, and a monthly salary,” I can only assume that being a “prisoner” to a monthly salary — if that’s your objective, getting paid — is gonna limit choices and opportunity elsewhere. That’s just a wild guess as to what the guy means. RUSH: I know, I would add politicians to this guy’s definition of journalists. You talk about people who impose activities, impose laws on activities they know nothing about, and you know who’s at the top of the heap on that one is Obama. Here’s a guy hasn’t done anything. If you look at his resume, he hasn’t done anything, particularly in the private sector. Yet what is he? Expert on jobs. Expert on health care and an expert on related to things like pharmaceuticals. Expert on automobiles. Expert on saving money. Expert on immigration. Expert on virtually everything. He hasn’t done diddly-squat! He’s definitely not a doer. Now, I’m not trying to relegate to insignificance the fact he got elected. That’s a major achievement. But in terms of actually having been in the world and done something as opposed to being in the stands and observing and commenting? It’s a phenomenon. It’s a phenomenon in our culture today that the people who are thought to be the dregs of our society are the doers and those who were attempting to do. And the people we laud (outside of pop culture) and revere and hold up to great reverence and respect, are the commentators. They’re the great protectors. They’re protecting us from the evil and the mean-spiritedness and the extremism of the doers. I’ll tell you, folks, it’s a problematic thing about journalism particularly, and it has been something that has been gnawing at me for my entire career. It’s especially true, I think, of politicians as well and who gets respect and who gets suspected. RUSH: Now, I don’t mean to pick on Deb Feyerick. She’s just one of any number of people I could use as an example here, but when she’s got Bill Nye the Science Guy… By the way, Bill Nye “the Science Guy” is another questionable thing. I mean, he’s not a science guy. He has a degree in mechanical engineering, and he’s on television — for kids primarily — as an expert scientist. He’s got all the answers when it comes to science. He doesn’t have a science degree. Mechanical engineering degree. But he wears a white coat on TV. And that’s all you need: The optic. White coat? Answering questions about science? Bingo! You’ve got credibility and you are an expert. It’s like Obama had a bunch of people up to the White House and wanted to look like doctors so he gave ’em white coats. Well, they were doctors but some of them showed up in normal sheet clothes and the White House said, “You wear have that! We’re trying to create some optics here.” So the doctors all had to wear white hospital gowns to make it look like they were real doctors, otherwise people wouldn’t have known and wouldn’t have accepted it. So here’s Deb Feyerick. She’s talking to Bill Nye the Science Guy. So maybe she is a doer. She “delivered a cow while on assignment” and she “writes about life as a working mother. The New York Association of Black Journalists honored her for her coverage of the foreclosure crisis. The American Muslim Union named her an outstanding journalist.” Bill Nye the Science Guy has a degree in mechanical engineering, but he wears a white lab coat so he looks like an expert in science. 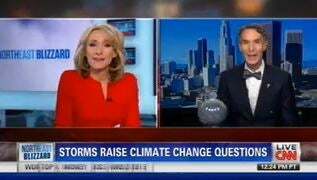 I don’t want to make too big a deal out of this, but when I see a reporter actually seriously ask a “science guy” if global warming could explain a meteor getting close to the earth, I’ll tell you what I think of. Little kids in classrooms being told the same stuff and growing up thinking the same stuff.